Open the QuickBooks company file that you would like to associate with your QuickBooks Attached Documents subscription. It is important that you choose the correct company file. If your company file is set up with multiple users, be sure to log in as the Admin user. If your QuickBooks company file has not been associated with a QuickBooks Attached Documents subscription yet, our welcome page will come up. Please click the "Sign In" button on our welcome page. Finally, you should see a dialog that looks like the image below. Sign in with the same User ID and Password that you used when you signed up. 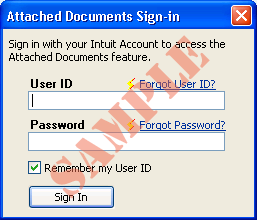 If you do not remember the User ID that you signed up with, try searching your email for a "QuickBooks Document Management Signup Confirmation" from admin@workplace.intuit.com. The link in that email should take you to an Intuit Workplace sign-in screen with your User ID prefilled. For further help, you may also use the Forgot User ID? and Forgot Password? links. Upon successful sign-in, QuickBooks will find your new QuickBooks Attached Documents1 subscription and associate it with your QuickBooks company file. You're now set to use your new service! Going forward, when you go to a QuickBooks list or transaction and click the QuickBooks Attached Documents "Attach" paperclip, you will be taken to an Attachments dialog, which lets you attach any document to that QuickBooks list or transaction! If you still need further help in getting set up with QuickBooks Attached Documents, please reach out to our Customer Care agents at (800) 450-8475. Thank you!